OLD PARKED CARS. : 1966 Ford F-150 Custom. 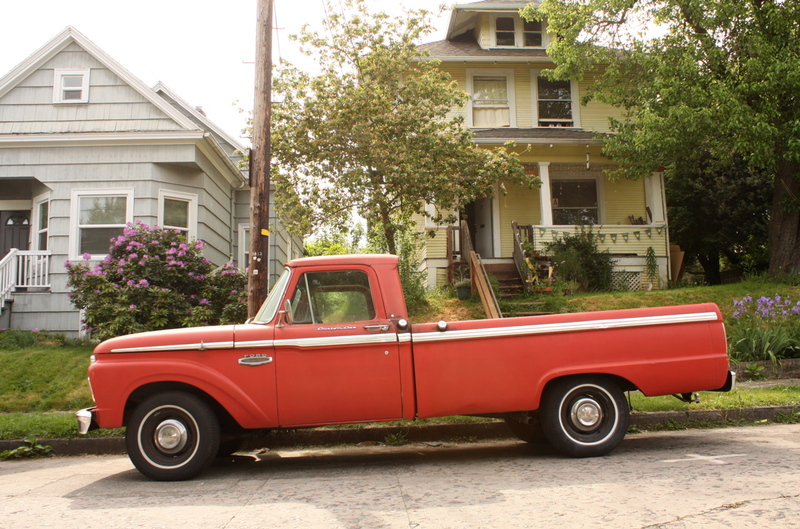 BUT SERIOUSLY THAT IS MY DREAM TRUCK! holy cow, besides the fact it's not a '65, this comes right out of my brain. Date with a Ford v8. Today when you have a truck, you have your extra cab, your crew cab, your chrome wheels, your air conditioning, your gps, your iPod. This old Ford is as real as it gets.It has none of the creature comforts. It most likely has three-on-the-tree and a big box in the back. What else do you need? Dig the dogdishes and the thin whitewalls, paint has a nice slight patina too. Cool. But where's the cab-over camper? 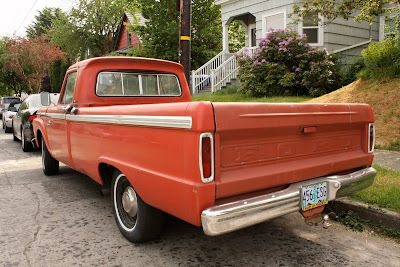 By law, a truck of this style and vintage should have a period-correct camper. Really a nice truck. Unmolested, straight, clean, tidy. Ready to put in a days work for a days pay. Nearly 50 years old, still running. These photos provide strong evidence that there is great value in these old, simple machines. There are probably no circuit cards in this truck, no brain box, no electronics to fail. Spares should be readily available for the foreseeable future. That's not to like? "These photos provide strong evidence that there is great value in these old, simple machines." This comment says it all. Now this is a positive of the Colorado area we have tons of these 65-72 Ford, Dodge, and GM pickups still on the road out here. 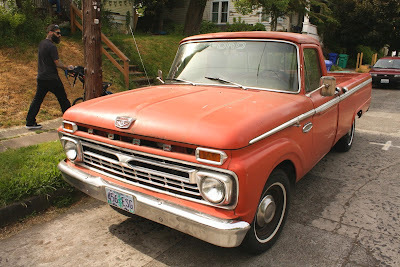 me and the misses next project after my MK1 Cabriolet is going to be either a 67-69 C10 short bed or a 68-72 Ford F100 Ranger. The color and age make me suspect that it had the DOT in its history. It's got the sliding back window, which probably passes for air conditioning. Really hits all the right spots - great truck. Would love to own it. This was was deluxe truck in its day with all the extra trim and fancy dash trim. Nice to see. They are usually thrashed. not a comment about the truck.. which is - yes - a beauty... but about the stoner dude walking a baby behind it. candid photos - whether of old parked cars (or trucks).. or who they catch in the background.. never disappoint.